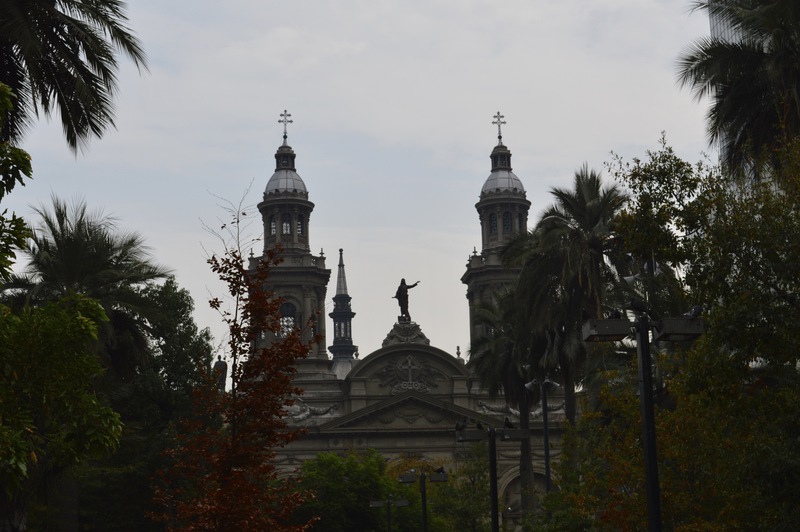 Our trip to Santiago was split into two. This was due to our flight schedule down to Punta Arenas in Patagonia. In total Courts and I spent four days in the city, of which Jess was with us for two. 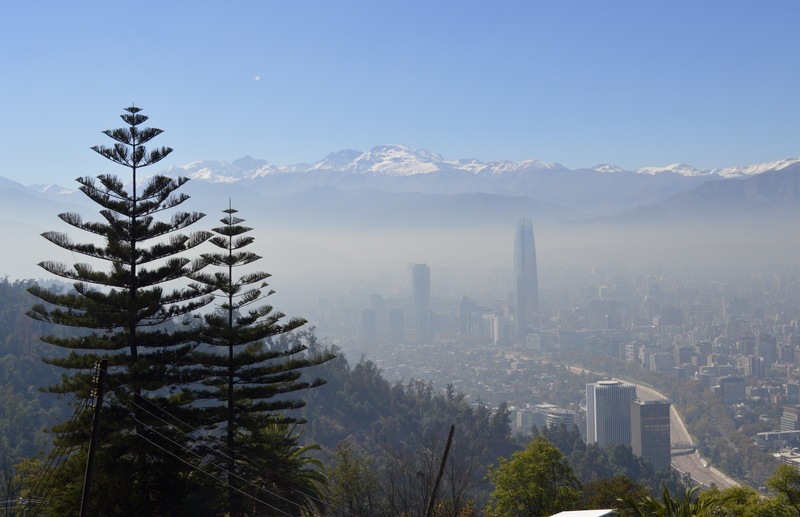 The first time we arrived in Santiago was a disaster. We had taken an overnight bus from Mendoza, Argentina to Santiago, Chile. This was an 8 hour trip so we thought an overnight bus would be perfect. However, we forgot to take into account that we would be crossing the border and that would require us to be awake and moving. 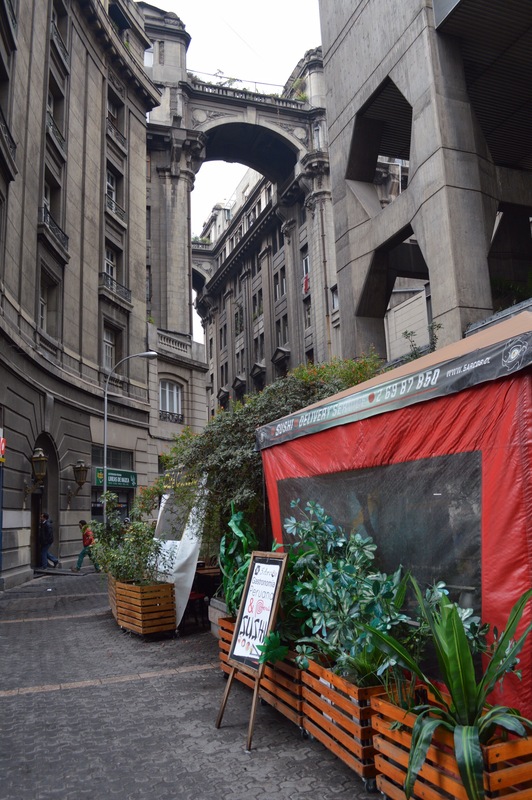 We arrived in Santiago at 6 am and went to our hostel hoping they would allow us to have an early check-in or allow us to pay for anther night. The lady working at the hostel told us that it was full and that we would only be able to check in at 2 pm. Our next hour involved us walking to 8 other nearby hostels asking if we could have a bed, but all of them claimed to be full. Eventually we decided that our only option was to go and make use of the WiFi at McDonalds. We were all exhausted, having not slept the night before (keep in mind that we had been wine tasting in Mendoza all day prior to our bus trip) and arriving in a new city with nowhere to go. We decided we needed to make the most of our time, that we were trying to kill, until we were allowed to have a nap at 2 pm. Jess and Courts discovered the hill, Cerro San Cristóbal. It was close to us and looked beautiful. We took a funicular up Cerro San Cristóbal (the round trip only cost us R40, USD 3.5) and the views from the top were beautiful. This hill is 850 m above sea level and 300 m above the rest of the city. This is the largest public park in Santiago. 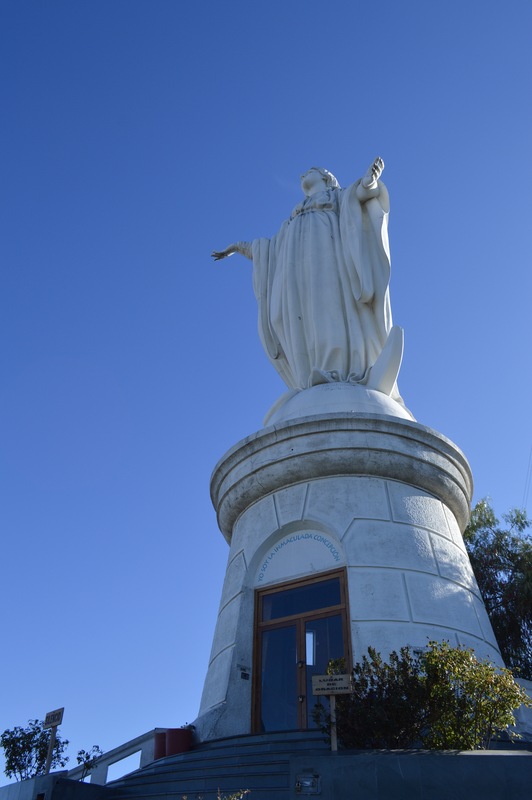 The top of the hill is home to the 22 m statue, Virgin Maria. This reminded me a lot of the Christ the Redeemer statue in Rio, but on a smaller scale. One can also walk around the top of the hill and take in the panoramic views of the city. 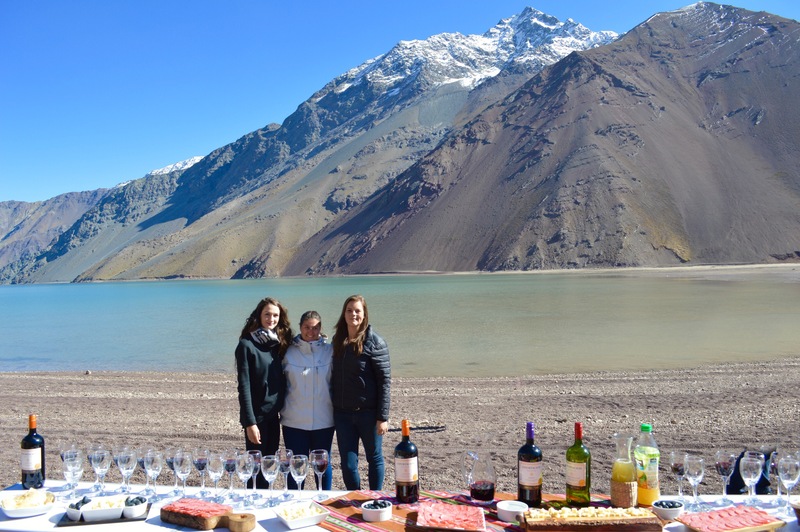 We took a day trip to see the Embalse El Yeso in Cajon del Maipo. This was a three hour drive out of Santiago but the time spent in the car was completely worth it! 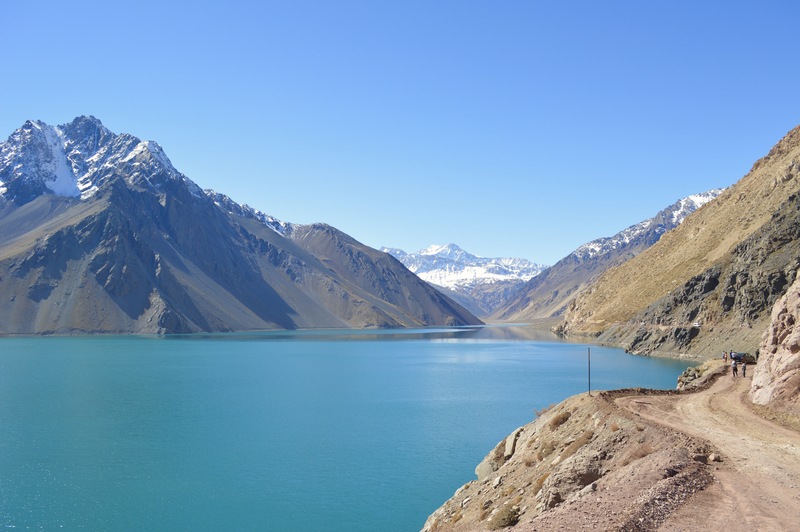 Cajon del Maipo is a basin in the Andes mountain range, with its most famous attraction being the resovoir known as Embalse El Yeso. This reservoir is one of two major water sources for Santiago. 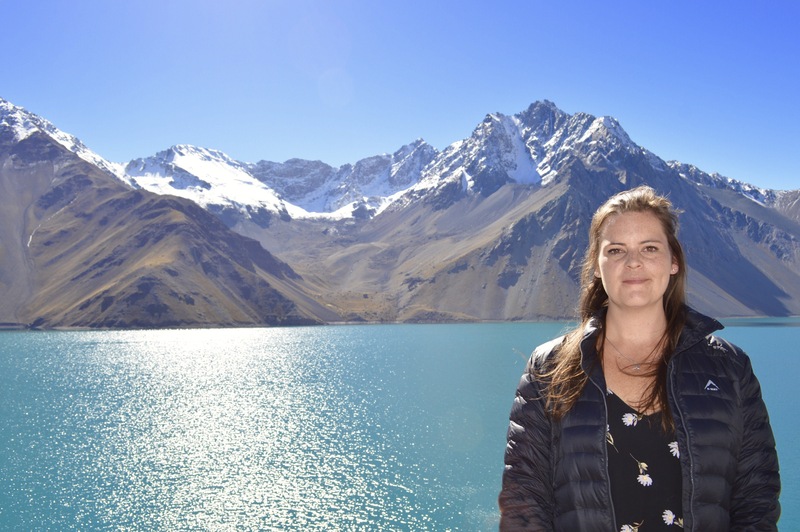 Embalse El Yeso has a unique turquoise water color and a background of snow capped mountains. The unique color of the water is due to the minerals from the Andes mountains. We were fortunate enough to spot some Andean condors while taking in the beautiful scenery. These birds are vulture like and can be seen only in the Andes mountains. They are the largest flying bird can have a wing span of up to 3 m.
We arrived at the reservoir and had some free time to walk around and take photos. Our guide supplied us with a lovely picnic that included cheese, salami, olives, wine and pisco sours. Pisco is a type of brandy that the Chileans and Peruvians argue about constantly. Each country claims that they invented the alcohol, and avoiding the topic while in the company of people from both nationalities is advised. Nevertheless, this picnic was delicious and with a picture perfect background, what more could one want? 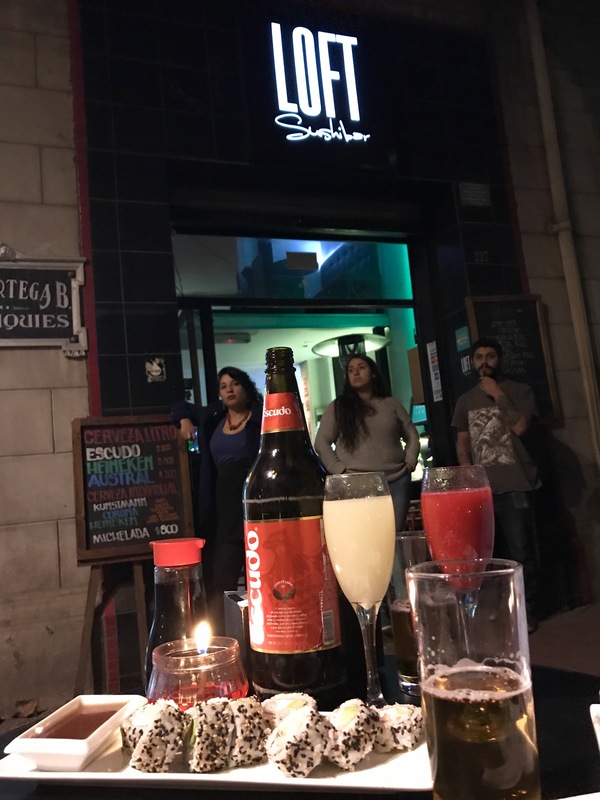 The second time we visited Santiago was very bittersweet. I was excited to be back in the city but this was the point in the trip where Jess was leaving us. We said our goodbyes at the airport and Courtney and I continued into the city. In our depressed state, Courts and I went to venture in the rain in order to see more of the city. We decided to do the downtown walking tour, which was fantastic! 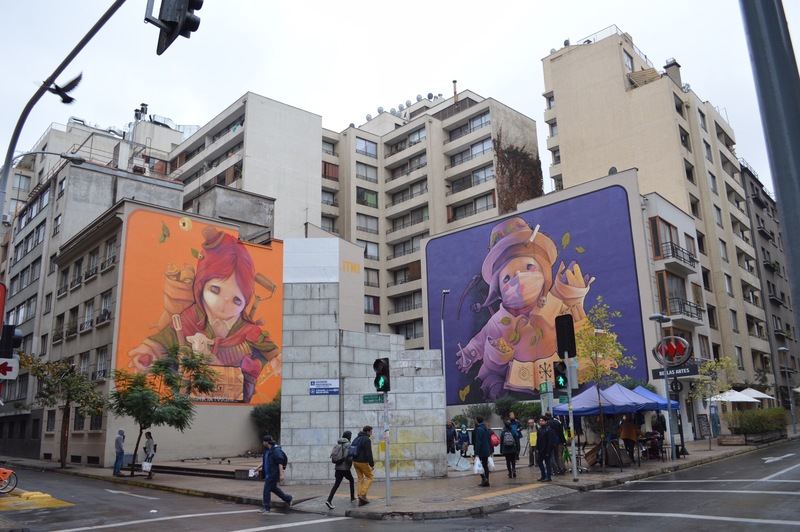 On the downtown walking tour we visited the Bellas Artes neighborhood (where we saw some street art), La Moneda Presidential Palace and Plaza De Armas. Carlos, our guide, was amazing. He was great at trying to explain Chiles complicated political past and the current issues the county is facing. Something I found interesting, is that Chile is a strongly Catholic country. Divorce only became legalized in 2006 and abortion is illegal (no matter the circumstance). If a women is found to have had an abortion she will be put in jail immediately. On our first night in the city we were staying in an university area. This area was filled with bars and restaurants. 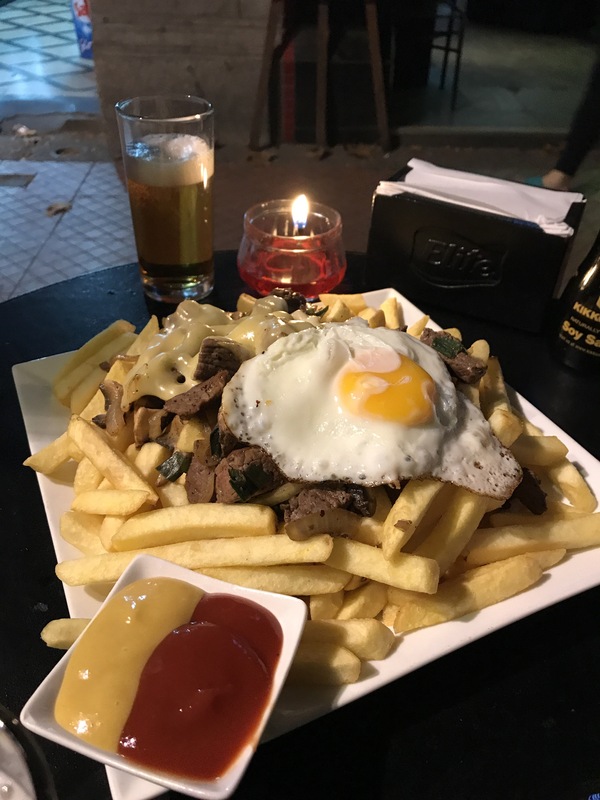 We went to find a beer and saw that everyone around us was eating potato chips topped with steak, cheese and eggs. This dish is called Chorillana, and is ment to be shared. We decided to try this dish, and along with some Chilean beer we found it to be delicious. One portion of Chorillana filled the three of us and only cost R 60 (USD 4.5). 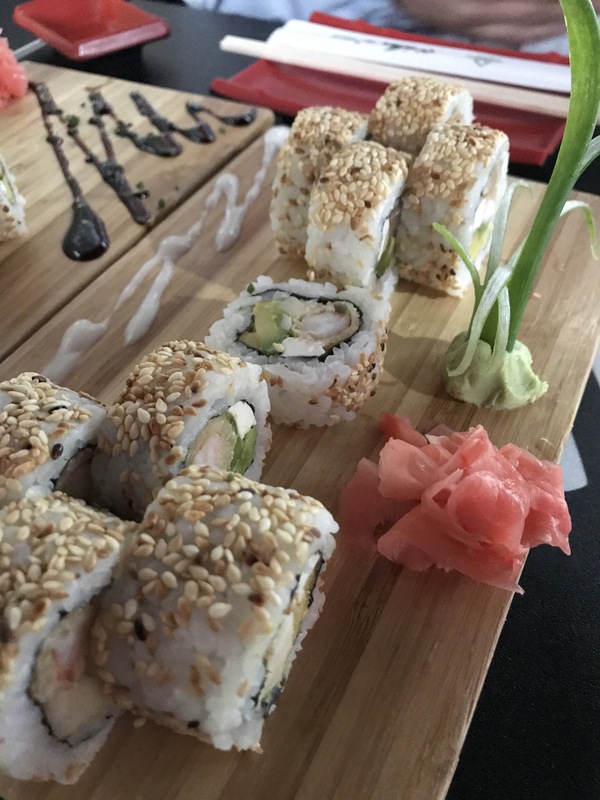 Something we all found surprising was that sushi seemed to be everywhere in Santiago! 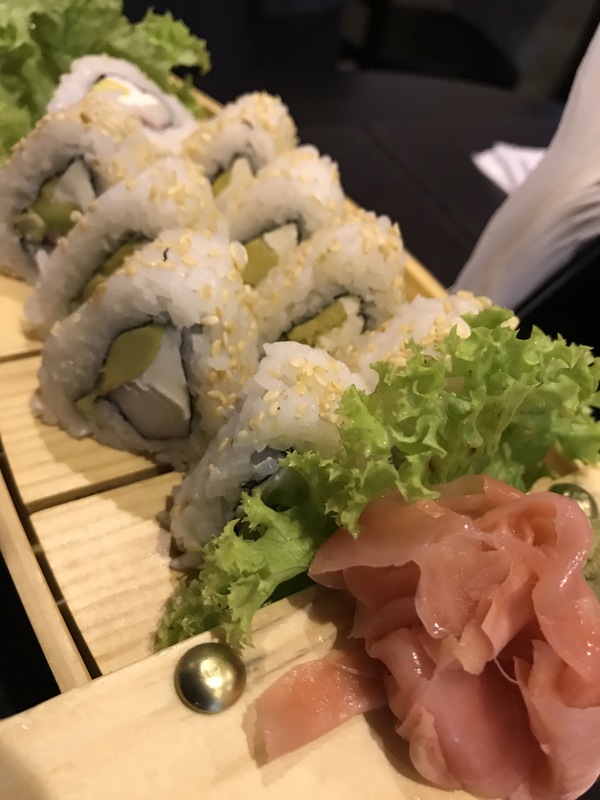 I was fortunate enough to eat sushi three times, and it was DELICIOUS!!! 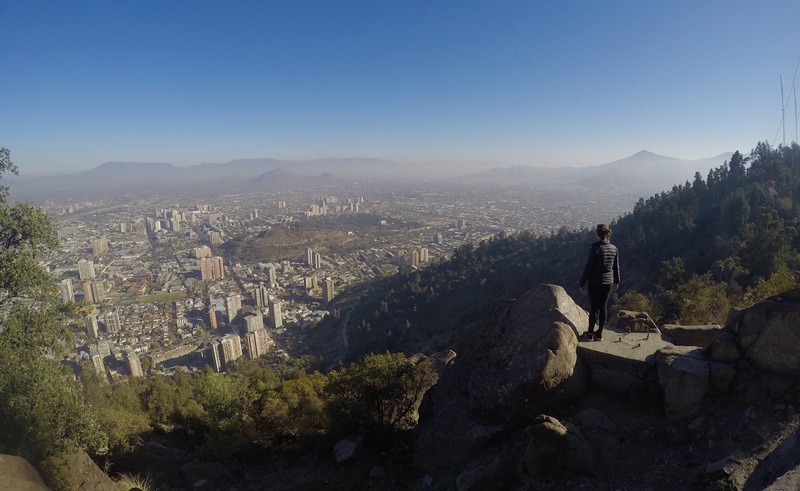 Our time in Santiago was filled with ups and downs, but it was one of my favorite cities that I have been to in South America so far. It felt safe and had a great vibe to it with people playing music and preforming on the streets. Definitely a must-do if you are ever in Chile.